In 1927—almost the exact chronological midpoint between America’s first car and the debut of the earliest computer—Palo Alto broke ground on the sleepy city’s Varsity Theatre. For fifty years, the theatre treated moviegoers to some of the twentieth century’s most beloved films. Then, following a brief stint as a bookstore, the Varsity Theatre was revitalized in 2015 through a partnership with our friends at HanaHaus. Now the cafe is one of our most spacious locations, with an airy courtyard and a communal workspace. In addition to offering our espresso, blend, and single origin coffees, our Palo Alto cafe offers a full breakfast and lunch menu. 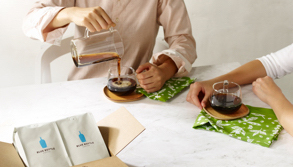 Last but not least, in what some might consider a stunning (though not altogether surprising, given the geography) departure for Blue Bottle, Wi-Fi is available for all. Palo Alto teaches coffee classes on Saturday afternoons. Details can be found here.